TechBBQ reveals its full program today at techbbq.dk. 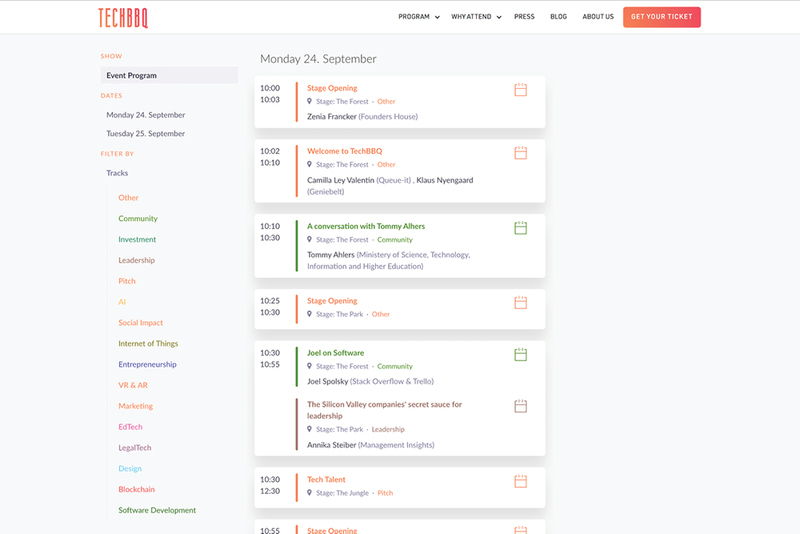 Once again, this year’s 5,000+ participants for TechBBQ in Copenhagen 24-25 September have a tightly packed stage program to look forward to. Nearly 100 Speakers from 15 different nations will gather and talk about interesting startup topics including: Investments, impact & innovation along with technologies such as AI, IoT, Blockchain and many more. The program also includes pitch competitions, some surprises and a royal visit. You may already have some glimpses of this year’s summit targeted at startup founders, tech enthusiasts and investors with TechBBQ’s announcements of a few Keynote Speakers such as CEO & Co-Founders from: Trello and Stack Overflow, Joel Spolsky along with IFTTT, Linden Tibbets and Bracken P. Darrell, Logitech. 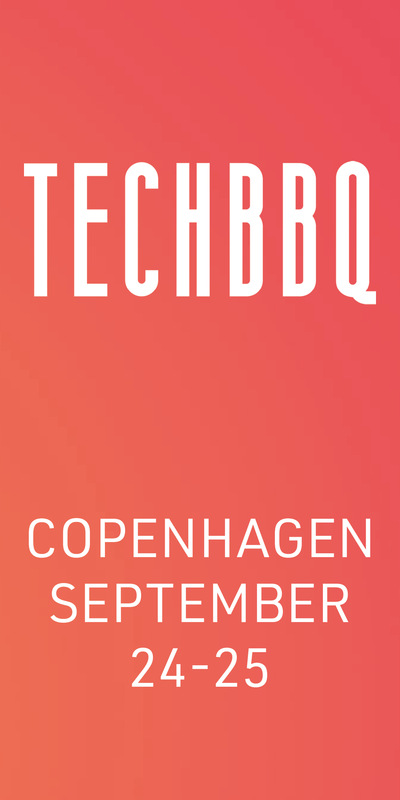 However, the time has come to unveil the full program of TechBBQ 2018, which is available on TechBBQ’s website (see the program here: techbbq.dk) from today. The program is reminiscent of the familiar taste of good-old classic BBQ with addition of new ingredients and flavours. “The recipe for this year’s program is in many ways similar to that of last year with pitching competitions, inspirational success stories from founders and speakers with a focus on skill development and deep tech, which is exactly what our participants want. Although many startups are already creating sustainable businesses, we are convinced that they will definitely be at an advantage on their road to further success by harvesting the experiences of founders and experts from tech hubs all over the world. That is why we have added more international flavour to this year’s program with speakers from even more countries than last year. True to tradition, the participants will have an opportunity to be inspired by the local heroes such as former entrepreneur and Danish Minister for Higher Education and Science Tommy Ahlers & Christian Stadil, Thornico owner and co-founder most known for founding the sports brand Hummel,” says CxO Avnit Singh, TechBBQ. H.R.H the Crown Prince of Denmark will stop by on the first day of the summit to take a closer look at the Danish startups at the industrial venue of the meatpacking district, which will once again come alive with technologies of tomorrow from more than 150 aspiring startups and established scaleups within virtual reality, robotics, fintech, healthtech, AI, foodtech and many more. TechBBQ is very much looking forward to this visit. The Crown Prince has a great interest in innovation and technology. As a protector for DenmarkBridge, a membership-driven initiative, consisting of Danish corporations bridging the gap between Danish companies and Silicon Valley, H.R.H. plays a very important role in ensuring that Danish entrepreneurs get access to more knowledge, network and capital. We are very proud to have the Crown Prince announce his visit to TechBBQ 2018. It is very important for the Danish startup ecosystem to have this kind of support,” says CxO Avnit Singh, TechBBQ. Last but not the least, this year’s TechBBQ brings forth more workshops with an opportunity to roll up your sleeves and contribute to topics and new initiatives such as: AI Driven Business opportunities, Making startups and innovation better, Nordic Startup Council and many more. Should you be hungry for more great experiences when TechBBQ closes at 6:00 PM on 25th September, there will be a grand after-party at Halmtorvet 9A from 8:00 PM. Keep an eye on TechBBQ’s website for more information and details regarding the event. Sep 11 Guest Entry: Your conversion rate depends on one single word!